It wasn’t too terribly difficult to come up with a scrumptious recipe. I took my usual focaccia recipe, most frequently made with fresh rosemary and sea salt, and played around with it. I added the dried fruit and a little sugar. There is a little sugar in the dough and then some sprinkled on top for a crunchy and sweet bite. There are so many reasons to try this recipe. Clearly it is delicious, but it is very kid friendly. It is a quick breakfast on the go, especially when sliced and spread with Nutella. It is a nice addition to a brunch menu. We always have some kind of sweet with brunch and this would be perfect. It isn’t terribly sweet or fattening. To liven it up a little you could do a chocolate drizzle on top or add chocolate chips into the dough. Just be forewarned, it can be a little addictive! Soak dried fruit in the 2 cups hot water for 5-10 minutes to plump them up. Drain the soaking water into a measuring cup to the one cup mark, discard any extra water. Make sure this water is at about 110 degrees, warm for a few seconds in the microwave if needed. Add the yeast and let bloom for five minutes. Combine the flour, sugar and salt in a large bowl. 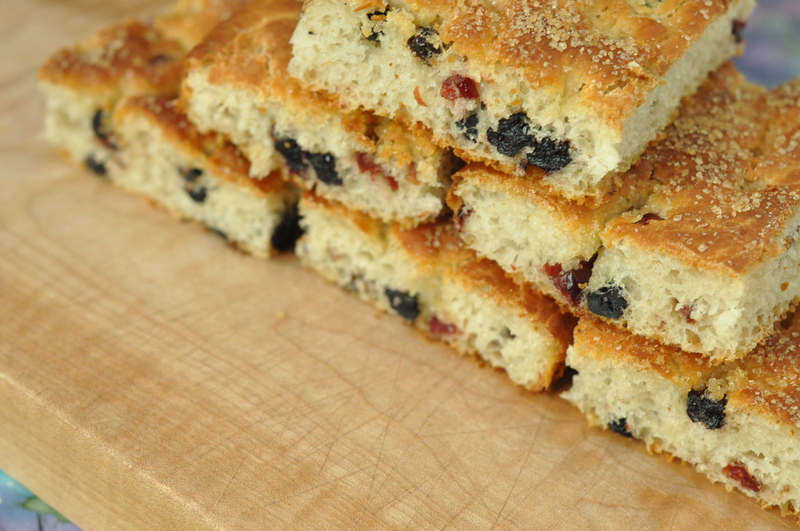 Make a well in the middle and add the yeast mixture, milk, oil and dried fruit. Stir until everything is evenly combined, it will be very moist. Beat well with a wooden spoon for a minute (or you can knead with one hand directly in the bowl). Cover the bowl and allow to rise in a warm place until doubled in size, approximately one hour. Spread a jelly roll pan (11×17 inch) with olive oil, both the bottom and sides. Pour the dough from the bowl onto the pan and spread to completely cover the pan. If the dough resists let it rest a few minutes. Poke holes in the dough with your fingers, about every two inches. Drizzle the top with olive oil, cover and let double in size, about an hour. With 20 minutes left in rising time preheat the oven to 450 degrees. Once the dough has doubled in size sprinkle the top with turbinado sugar and place in the oven. Bake for about 25 minutes, until it is golden brown. You can served immediately or remove from the pan and place on a cooling rack so the bottom crust doesn’t get soggy. Thanks! The boys certainly enjoy it any time of day. 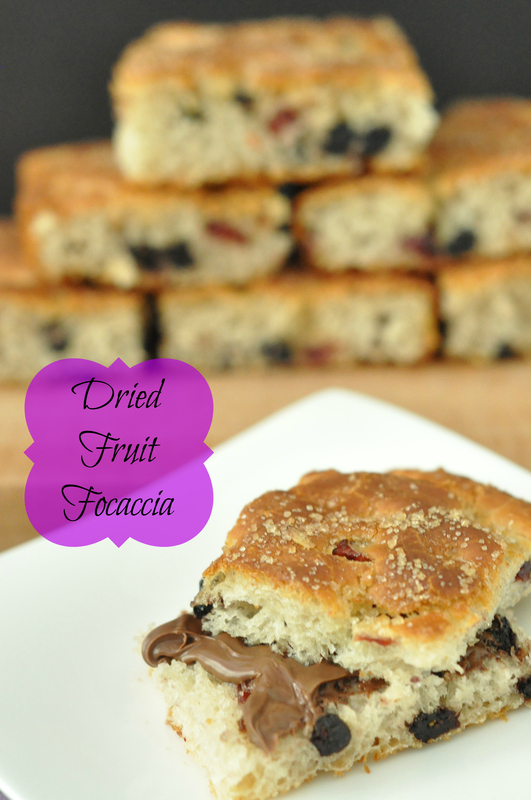 It was definitely a fun twist on focaccia. 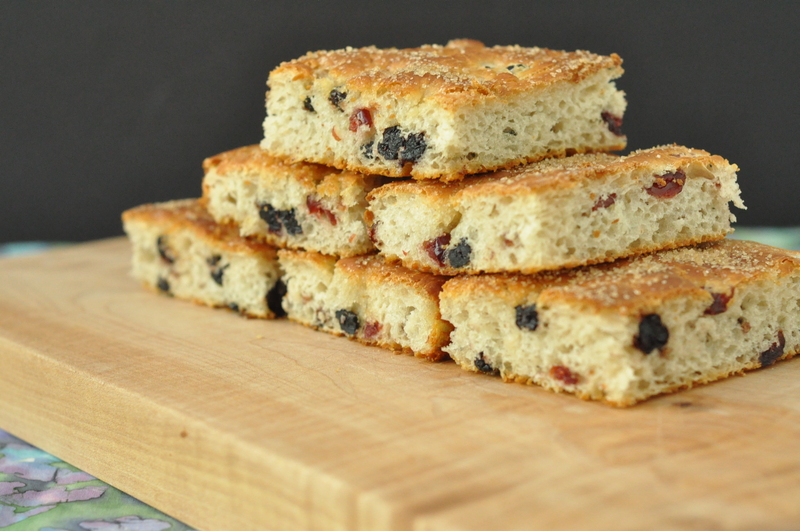 Perfect with a cup of hot tea…a delicious way to start my morning. Thanks Karen. It,would be fantastic with hot tea. I’ve been into making chai lattes in the morning lately.